Embest Mini6045 processor card is a ready-to-use ARM embedded controller based on 400MHz Atmel AT91SAM9G45 ARM 926EJ-S microcontroller which is designed to provide a high performance processor solution with a high flexibility for general and multimedia oriented applications. The Mini6045 processor card has external 256MB (2*128MByte) DDR2 SDRAM, 256MB Nand Flash, 4MB Data Flash, 2Kbit EEPROM on board and is capable of running Linux 2.6.30 open source operating system. Many peripherals like UART, Ethernet, USB OTG, LCD, Touch screen, RTC, TF card slot are brought out by connectors. The processor card can be plugged in your expansion board through two 2.00mm space 80-pin connectors which contain I/O and all hardware interfaces. The fully expansion can be used adapted to customer requirements. 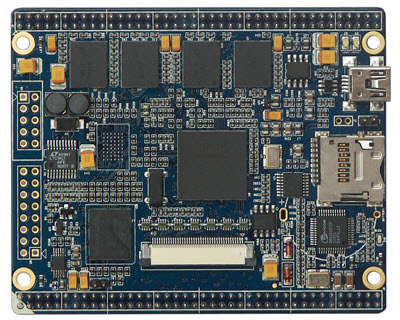 Embest also designed an expansion board which can fully evaluate Mini6045. The whole system is called SBC6045 Single Board Computer. Embest offers Linux 2.6.30 and WinCE 6.0 BSP for this board. This is a solid reference board for evaluation and customers can leverage our experience to increase your own productivity.